The county seat of Garvin County, Oklahoma, Pauls Valley is located near the Interstate 35 juncture with State Highway 19, fifty-seven miles south of Oklahoma City in the heart of the fertile Washita River agricultural complex. Corn, wheat, hay, and cotton have been grown successfully in the region. With abundant feed available, cattle production is a major activity. Pauls Valley also hosts businesses catering to the petroleum industry, which is secondary to agriculture in the town's economic base. In recent years the community has diversified its economy by recruiting manufacturers of plastics and other products. Pauls Valley was settled by Smith Paul, a North Carolinian and an intermarried citizen of the Chickasaw Nation. At the confluence of Rush Creek and the Washita River he established a plantation-sized farm shortly before the Civil War. Soon, "Smith Paul's Large Farm" was a location to which mail was often addressed. After the war Paul was appointed agent for the remnant bands of Indian refugees in the Rush Creek valley. His estate, known as "Smith Paul's Reservation," was a mail stop on the government road to Fort Sill. Official recognition as a postal office came in 1871 with the designation as "Paul's Valley, Arkansas," a misnomer occasioned by the fact that Indian Territory was then administered from the Western District of Arkansas. In 1887 the Atchison, Topeka and Santa Fe Railway completed its line from Kansas to the Gulf Coast, passing through the Rush Creek valley. Tecumseh McClure, Paul's stepson, controlled the land around the original townsite and did not want a depot there. Sam Paul, Paul's son, granted the railroad land for a station one mile north of the settlement, with the provision that the depot be named "Smith Paul's Valley." However, the name was too long for the station sign and was shortened to "Paul's Valley," which was later corrupted to "Pauls Valley." As incorporation of cities was against the laws of the Chickasaw Nation, Sam Paul had town lots platted near the depot and, through a "townsite company," sold patents to lots fronting the railroad. Merchants, advantaged by the railroad's capacity for quickly transporting goods to and from eastern markets, turned the community into a marketing center. By 1890 Pauls Valley's population had grown to 396 people. Selection as a site for the U.S. Commissioner's Court in 1895 strengthened the town, and in 1898 the population reached 1,407. The 1887 town plat was approved by the Dawes Commission in 1903. 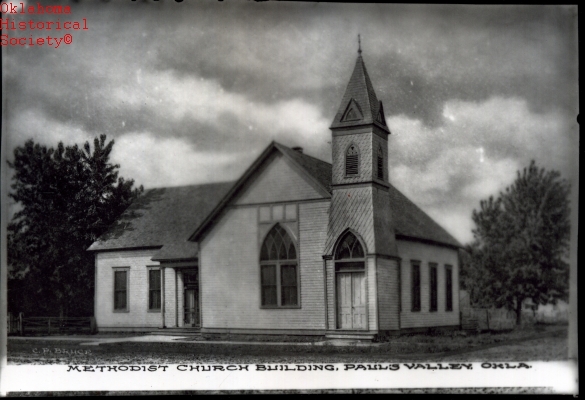 Pauls Valley wrested status as county seat from competitors during 1907 statehood elections when floodwaters prevented opposition voters from reaching ballot boxes. At statehood Pauls Valley's population was 2,157. By 1930 that number had reached 4,232. Since 1960 the population has remained nearly constant, fluctuating between 5,500 and 6,800 people. There were 6,256 residents in 2000 and 6,187 in 2010. At the turn of the twenty-first century three Pauls Valley properties were listed in the National Register of Historic Places: the Garvin County Courthouse (NR 85002758), the Santa Fe Depot (NR 85003651), and the Pauls Valley Historic District (NR 79001993). "Oklahoma's Live Young Cities," Sturm's Oklahoma Magazine 4 (June–July 1907). Pauls Valley Chamber of Commerce, From Bluestem to Golden Trend: A Pictorial History of Garvin County, Covering Both the Old and New (Fort Worth, Tex. : University Supply and Equipment, 1957). Pauls Valley (Oklahoma) Enterprise and Valley News, 21 January 1937. Michael Tower, "Pauls Valley," The Encyclopedia of Oklahoma History and Culture, https://www.okhistory.org/publications/enc/entry.php?entry=PA019.